Amazing how it happens over and over, the forgetting of my light. As soon as I forget, I fall out of “the flow” – that feeling of everything sailing along, synchronicity after synchronicity happening with my delight in the forefront. A detached compassion for the ups and downs and even a chuckle sometimes when I stumble. I went on a personal retreat recently. A mentor taught on Walking the Path of the Initiate. Beautiful. It’s been awhile since I’ve gone on a retreat of this nature, where there is space built in for nourishment as well as an intention toward growth & self-awareness. 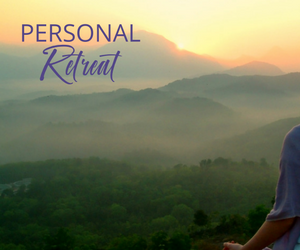 I was yet again reminded of how absolutely essential personal retreat is for me. The yin (being) is so crucial to balance the yang (doing). And I must fill up again to walk through my life with awareness vs being run by old patterns and fears. Yet what about daily life? What about when I crash out of the flow and wonder what the heck just happened? When it feels like I’m running into door after door and not being so nice to myself when I do. Just the other day sitting at my desk for 5 hours, my shoulders up to my ears, not breathing and banging away at the key pad, 400 things on my to-do list, will I ever complete my tasks?! WAIT, that’s the old way, part of the old paradigm that I subscribed to much of my life. I remember using the saying “no pain, no gain” to motivate myself in those times. I CHOOSE not to live this way anymore. How to find my way back to the flow? Well, I can tell you, it’s not through doing, it’s not through pushing, it’s not through “figuring it out”. It’s through waiting, pausing, breathing, sitting in the agitation and being with it… Boy is this a challenge. Every time. Sitting with is what I most resist. Being patient with my process. Allowing the uncomfortableness to be there without doing anything about it. If we don’t take the time to do this, we actually BLOCK the energetic support that is here for us… universe, flow, consciousness, the field, god, angels, whatever you want to call it… it’s a REAL thing & to truly live in the new way, to truly open up to the intuitive age that is well past knocking on the door & has actually sat down on the couch, we MUST learn to open up to this space. Then I put into place one thing that I know supports me (and this is so personal for each of us) maybe it’s taking a yoga class, or sitting in nature, or deep belly laughs, or giving my feet a massage, or dancing. A foundational practice that I go back to again and again to recenter. Today I chose a yoga class and the message was so very relevant… PATIENCE. The universe is always sending messages, we always get what we need to grow, to learn, to expand. Question is, are we slowing down enough to listen & integrate? Today yes, I am. This path requires courage. This path of stepping out of the boxes we’ve put ourselves in… for whatever reasons – to please others, to win approval, to fit in, because being “this way” is what you’re supposed to do, because we didn’t have any other way modeled for us, because it’s easier to be part of the herd, etc. I have been through massive change in my life. Upon recent reflection, I realize much has been required of me to continually step forward. One of my mentors recently stated that 80% of success (however you define that word) is based on the ability and willingness to not only step outside of your comfort zone but to also sit with what comes up when you do that. I’ve heard this in many different iterations before and recently re-committed to doing just this. Do my inner voices quiet? No, actually they get much louder. A few examples “you are not intelligent”, “you will be alone if you do this”, “no one will like you”, “you should be ashamed of yourself for wanting to be seen”, “you don’t know what you’re doing”, “you are not good enough”, “nobody cares what you have to say”, “it’s not perfect, so you should wait to do it until it is”, “later is better”, and on & on. Maybe you can relate to some of these. The way my particular structure works is that one of these voices will show up and I’ll either feel an immense amount of shame within me or I’ll get fuzzy and go a bit unconscious. The shame many times derails, sending me right back to my comfort zone with my tail between my legs. The fuzzy sensation causes me to step into habitual patterns that I do without thinking, such as distract myself: phone a friend, eat, find something unrelated to do, spin my wheels, gravitate towards tasks that are not important, etc. So how does one step forward in the face of this internal barrage? This is where the courage comes in. I first feel the shame. I notice it and kindly say “oh, there you are”. Then I breathe with it until it passes. It’s taken some foundation setting & shadow excavating to separate enough to be able to see it and not be swept away by it. I remind myself of the way I want to feel and the life I want to live – in alignment with my highest self, in integrity with my truth & joyfully serving the greatest good. If the voices/ shame/ fuzziness are particularly strong, I will incorporate the self care techniques that I’ve cultivated yet need to be reminded of again & again – journaling with the fears, giving them space, meditation, breathing slowly, yoga, touching my heart, reaching out to my support team or stepping out into nature – to name a few. Then action. Moving through the fear by taking a step outside of that circle of comfort. I practice this every day – it’s like building a muscle. The more I practice, the more I realize how moving through our greatest fears can yield the most delicious abundance & gifts along the path. Large amounts of energy are freed from the fear, the boundaries & boxes, the walls of separation. Energy that can be repurposed towards living the life that is possible for each & every one of us. More synchronicities show up & I start living once again in the flow, realizing intimate connection to the greater whole. What is one thing you can do today that stretches you a tiny bit? Can you step through a small fear? Do it. It will most likely sting and you will see all of your “stuff” come up. However, you’ll start to cultivate an inner awareness that is crucial to expansion, you’ll start building examples that prove that what is on the other side is so worth it… living to the fullest potential possible, you’ll create the life you dream of right now in this present moment, not in some far distant “later”. 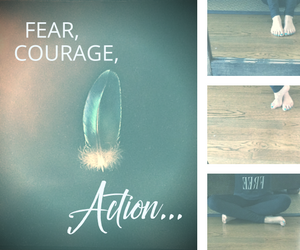 You got this, you got it, fear, courage, action – GO! I love to travel. Always have. I like the smell of airplane fuel. Driving anywhere near an airport, I get a whiff and a sense of excitement around stepping out of my “normal” life begins to take over. One thing I’ve come to realize about growing up when I did in the West is that it wasn’t widely encouraged for us to travel alone, or even do things alone like go to dinner or an event. Our media shouts out fears that tug at the underlying fears already present. Beliefs & thought forms are vibrations just like you & I are. They permeate the air we breathe, the food we eat, the atmosphere we live in. Collective beliefs pull us in if we aren’t aware of them & shape the way we view ourselves and our world. Since my father was a pilot for Delta, thankfully I sidestepped the fear of traveling to other countries. However, I did grow up with the elephant in the room around being a woman and not being able to do certain things without a man. I am grateful to all of the women who came before me and paved the way. Had they not done what they did, I wouldn’t be so free today. That first solo trip… I was in the middle of a painful divorce, determined to understand why I was getting divorced for the 2nd time, living in the house with my soon to be ex and needing a break. I looked at a map and thought, I could use a trip to a tropical spa-type destination. Pampering, beach, relaxation… yes! I spent a day researching and settled on the Sivananda Retreat Center in the Bahamas. I had been practicing yoga for a couple of years at that time and thought what a nice addition taking some leisurely classes would be. I told a few friends, whose comments were: “is it safe for you to travel alone?”, “isn’t there someone you can go with?”, “are you sure you want to do this?”. To which I replied, “I need this!”. And I thought it was only because I needed to get away from the situation I was in – ha. The humor of the divine is all pervading, a fact I see in retrospect and after 42 years of this life’s experience. SO, off I go to the airport with my passport in hand, a smile on my face and a fear in my stomach… you know that feeling where you don’t know if you’re going to throw up or laugh hysterically. I took several deep breaths throughout and kept repeating – “you’ve got this!”. As soon as the flight took off, I settled back in my seat ready for adventure and maybe for angels to start singing or something. Once landed, I found my way awkwardly to the dock for the boat ride. I was a bit nervous as the taxi stand was around the corner, not marked & one disheveled guy was standing there next to a run down car that had illegible markings on it. He said he was the person to take me to the dock. I gave him my bag with only a slight tremble in my hand as I thought about the fact I hadn’t even told my family where I was going or that I was traveling at all. The boat brought me to the dock of Sivananda… I walk up to the front and the guests had just finished their lunch and were clearing their own plates (hmmm, that’s a bit strange for a spa). I am shown to my room (the size of a shoebox, no air conditioning & common bathrooms). I am given the retreat schedule… 5a wake up bell, 530a chanting on the beach, 6a 2 hour yoga on the dock, 8a breakfast (cleanup duty), free time, lecture, lunch (cleanup duty), lecture, free time, meditation, evening yoga, dinner, chanting, lights out 930p… I worry that I am at the wrong place. Or, am I exactly where I’m supposed to be? Needless to say, the Ashram I had booked was not a spa and the 3 days there were hard and transformative and not what I envisioned or expected. 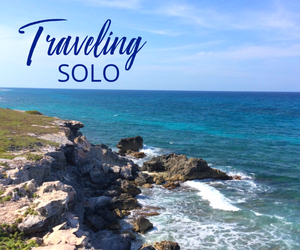 I had plenty of time to journal and sit with my expectations around the trip… which of course led me into seeing some unrealistic expectations I had been holding myself, my marriage & my life to. It ended up being the trip that touched into deep wells of strength & power I never knew I had. It was the first breakthrough to a self-confidence that has since blossomed in me. A confidence around taking care of myself, trusting myself and my inner guidance and in knowing that it is ok for me to stand powerfully in this world as a woman. Since that first trip, I have traveled solo to many other places in and out of the US. I’ve found that it doesn’t have to be far away for me to reap benefits. Many times it’s a trip a few hours away & into the wilderness. No matter where I go, it’s never what I envision or expect and I always come up against myself & my beliefs. I am able to see the ways I get caught in illusion. Stepping outside my “normal” day to day life, the world reflects back to me exactly where I am stuck but too close to see it. I always come back changed. I always come back with a new perspective for that “normal” life that doesn’t ever seem quite so normal anymore. I am better able to see the extraordinary magic that is in EVERY moment and I step forward with a graceful confidence that is born from being in other cultures, taking a break from the thought forms & beliefs I’ve inhaled and realizing that we are all beautiful and all human and all doing the best we can. So many new things come up with the Spring, don’t you think? This month, we’re receiving an extra boost of energy to support the multitude of changes on tap. Part of this energy comes from the placement of the planets and it might not feel very comfortable. We are being cleaned out from within & without – on an individual level and a global scale (politics anyone?). Old fears are coming to the surface. And they seem to hold even more weight than they used to, but it’s just a mirror trick. If we can turn towards them and breathe through them, we will find they become less and less debilitating. I find when I move through each one, I see that the Universe is offering so many opportunities to work the same thing again and again until it’s not triggering me anymore. 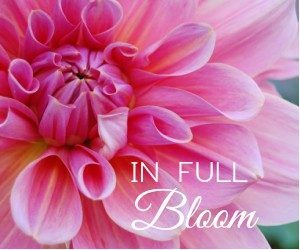 My current personal intention is BLOSSOM… stepping into the fullness of who I am on all levels, regardless of what seems to be in disarray. I just returned from a trip to see family where I met my 1 month old niece at the same time that my mother forgot who I was. It was but one example of experiences that have been presented to help me embrace both ends of the spectrum, the pain of life and the joy all at once. Really, one doesn’t exist without the other and though I’ve read about this and understood it intellectually for years, I am feeling it integrated into my whole being at this time. Using the practices of breathing, being kind with myself, creating space and taking care of my body have supported me in moving forward, not only without falling apart but also by touching into that joy in the midst of the pain. My mother is full of truly childlike wonder on some days and that makes me smile. Are you finding experiences in your life pushing you to a breaking point? Holding on by your fingernails to the semblance of normalcy you THINK means you have it all together? It’s a great time to gather your tribe of support (including yourself) and LET GO. Maybe one finger at a time (baby steps). Or hold the hand of a trained professional as you face your own shadows. Just trust that underneath it all, you are whole and this is all here to clear you into an expanded way of living. Know that you are not alone and this is happening collectively. We are all here with you and rooting for you. 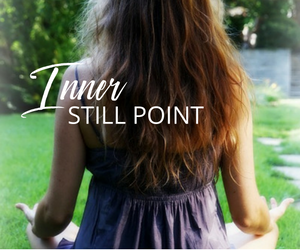 Recently my classes have been focused on finding the inner still point. Imagine you are seated and circling your waist in one direction… my guidance is generally to pause after several revolutions before starting to circle the other way. What this realization reminded me of was a conversation I had around integration. To move forward in our lives in a fully integrated way, we must be willing to pause and allow all parts of ourselves to get on board, to move in the other direction ONLY when we feel the pull, the call from within vs the push from without. For me, it is an exercise in patience. What does it feel like for you when you are being guided from within? The next time you are rushing through your day, take a moment to pause and breathe. I’ve been teaching yoga and meditating for 7 years now and still have to remind myself to breathe when I’m stressed. However, I noticed a leaps and bounds difference in the way I relate to the world since I started meditating. If you don’t have a meditation practice, start one. Hands down, it has been the thing that has supported me the most in tuning into that inner guidance. Slowing down the barrage of thoughts and voices in my head enough to be able to recognize the spaces in between has been the best gift I’ve ever given to myself. As I find myself pausing, breathing, feeling the old way unwind, there is a natural impulse to move forward in the new direction. And when I start to move that way, I smile at the rich feeling of knowing I am being guided from deep within. If you have questions about meditation, shoot me an email. Sitting on the runway at JFK watching planes take off. As soon as they do, they disappear, moving behind the clouds on this hazy day. Or truly becoming invisible. I choose to believe the latter. Many amazing things are invisible… like Wonder Woman’s plane. We all know her plane is there… how else would she be able to fly such amazing distances so quickly & be such a bad-a$$? There is also the invisible space between objects in our physical world. Many of us have believed that this space is empty, allowing our worlds to be defined by what we can see. However, physics shows us what many spiritual teaching have been leading us towards for thousands of years, that the space is actually quite full. What we can see only makes up .0000001% of matter. The rest, meaning 99.9999% of it, is the space of pure potentiality, of waves and frequencies of energy. Philosophers and scientists have referred to it as the matrix, the field, the current, etc. I read a young adult series called The Enchanted Forest Chronicles, about a year ago. In it, the King of the Enchanted Forest could alter ‘reality’ by reaching out and plucking the strands of thread that ran throughout the whole forest. I think about space like that… full of waves of energy, vibrations that might look like an infinite number of threads. Everything, all possibility, is here right now for us. All we have to do is center ourselves in the present moment, reach out and touch the thread connected to it and it is here manifest physically. The stories of our childhood are real, as real as the computer you are reading this on that is connecting you to the internet through these waves of energy. And we can alter them in any way we can conceive of IF we can imagine it. We are only limited by the mental constructs that we ourselves hold onto. We can alter our memories (and in fact do every time we remember something from the past). We are re-imprinting it into our cells and our bodies every time we think of it. It’s easier to see this when looking on the outside – have you ever had a long time friend whose stories you have heard told over and over again throughout the years? Do you notice the subtle shifts and embellishments that happen each time the story is repeated? We do that on the inside too. This is not only the stuff of fairytales & superheroes, it is reality, which we shape and morph through our thoughts, beliefs, emotions & habits. The adage “to see what your world will look like tomorrow, look at your thoughts today” is absolutely true. Now it is our turn to take off. Instead of the plane disappearing, the whole city of New York does. I smile in delight. Anything is possible. What’s going on for me these days? The winds of change… I feel the undercurrents of it, pulling me in directions unknown, to places I have yet to discover. How to move forward in my life while keeping myself open to whatever wants to manifest? Balancing the directive task-oriented self and also trusting in the unfoldment of my life. The usual discharges and distractions aren’t productive, I feel as if I’ve wasted time… time is my enemy. I need more time to contemplate the free fall. Where will I land. Can I plan the trajectory? Should I set up a crash pad just in case I miss the mark? Reminds me of when I was a kid and the swimming pool was cold. Instead of jumping right in and relishing the shock, I would dip a toe in and then walk around the pool. Next pass, I’d stand on the first step – walk around again, second step – walk around again, and so on. Prolonging the agony of the cold water. An early sign of self doubt, perhaps? An unwillingness to trust? I had jumped in before and had the experience of the breathtaking cold lighting up all of my nerve endings and reminding me of what it feels like to be ALIVE. That would quickly give way to the joy of floating in the pool. I didn’t trust this experience. Didn’t trust my own memories of it. It is all really a matter of choice, isn’t it? I have the choice to continue walking around the pool or I can tear my clothes off, run full sprint towards the water, launch myself into the air & feel the excitement of the unknown before a drop of it touches me. I can trust that as soon as I choose, that I am taken care of and wherever I land is exactly where I’m meant to be because that is where I am. Every moment of this life is a gift, an opportunity to learn something new. I can choose to be upset if I land somewhere I didn’t envision or I can open my curious wonder-filled childlike eyes & step into the next moment of the unknown with a smile. I choose that. I choose trust. GERONIMO!